I once had the pleasure of meeting Leander Keck in Cambridge where he used to attend the NT seminars when he was in town. Since then I have tried, from time to time, to read some of his work. It is amazing how fundamentalism* talks so confidently about the inerrant, perfect, infallible character of the original Autographs of the Bible when no one has seen one for more than eighteen centuries! Moreover, it is clear that originally no one thought the wording was perfect since copyists, translators, and authors had little fear of changing it. This is one reason the text critic’s task is so complex. He aims to unravel these changes in order to provide a text which is reasonably reliable. He has no perfect text to offer (pp. 56–57). I don’t have much to say on this since we’ve discussed inerrancy plenty on the blog and Keck isn’t saying anything that Warfield hadn’t addressed in his day (see here). I quote it here as just another example of the objection. The way I look at it, the text of the Reformation era, which isn't all that different (textually) from the Latin Vulgate, is more than reasonably reliable. 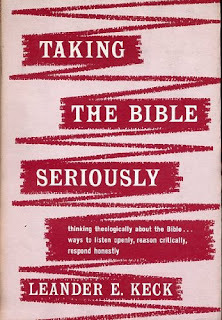 Being a sacred text this text is preferable to the (much later) critical scholars' text, which is an academic text for use in the academy but should not be used for devotional reading, religious study, preaching, teaching, or public liturgical readings. But....wasn't Erasmus creating a scholarly text when he edited the TR? And didn't he fill gaps in his Greek text by looking at the Latin Vulgate? Erasmus wasn't doing modern text criticism, he was revising the translation of the Latin Vulgate. His Latin-Greek NT was a scholars' text. Keck relies here on rhetorical tricks more than good reasoning. When he says, "it is clear that originally no one thought the wording was perfect since copyists, translators, and authors had little fear of changing it," first he groups together copyists, translators, and authors, as if the point applies the same to all of them, when it does not. The inclusion of authors here brings up the greatest potential for a problem for inerrantists. But this is where his relies on his second rhetorical trick to move the goal post away from inerrancy to perfection. Notice how he switches from the former word to the latter as if they are interchangeable, when in fact, his claim is much easier to defend when he says "perfect" than it would be if he stuck with what he was initially talking about and said "inerrant." To be inerrant is to be absent of affirmations of falsehoods. To be perfect is to have arrived at some final form. For example, if the author of one of the Synoptic Gospels used another of the Synoptic Gospels as a source, the later author may have considered the source text to be not yet perfect, meaning he recognized a need to say things that were not said in it or to say things that were said in it in different ways, while still not thinking that source text affirmed falsehoods in what it did say. I think you may be making a finer distinction than he is, which would not really be a sympathetic reading, eh? Couldn't we just accept that he is using the terms interchangeably? And why not? Most texts, as a rule, are not inerrant. I'd dare say I have yet to find a single inerrant text in the entire world. 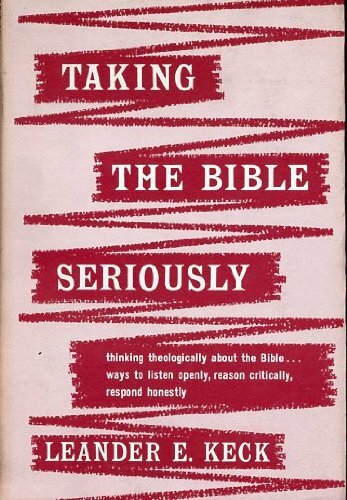 Even those people who believe in inerrancy usually consider only a single text in all of human history to have had the quality. All that to say, if I stumbled upon a text that was inerrant, wouldn't it be reasonable to assume that, for fear of sabotaging it, i'd be hesitant to change the words in it? What if one of my changes, however well intentioned, inadvertently introduced an error into what was the world's only inerrant text? I do think that assumption is more reasonable than not, and accordingly, I find in the fact that a variety of early actors (who are called by an ever changing list of names and titles) changed words in the text, a likely implication that a belief in inerrancy was not widespread among those actors. That seems reasonable to me, anyway. He does seem to be using the terms perfect and inerrant interchangeably. But this sympathetic reading results in his argument losing much of its force, since the claim that he makes in the quote I gave, as though it's a given fact is quite disputable, when inerrancy is what's in question. Consider the example of Tatian. Does his composition of the Diatessaron really imply that he must have believed that the four Gospels that he used as his main sources for that affirmed falsehoods? I think it seems more likely that the exact opposite was the case. Also using this example, we can see how Keck's claim sounds more reasonable when using the word "perfect" than it does when keeping in mind that he's really making a point about the ancients not believing in inerrancy. There is also present the same confusion of terms with regard to autographs. One can have the wording of an autograph without having the physical copy by the hand of the author. I've been wondering for a while why this blog has as part of its name "Evangelical". Is it presumed perhaps that authors or posters here share some belief in inerrancy?